The ceiling in the Cannon Beach city hall building has been known to leak according to employees. A proposed layout for a new City Hall building at Gower Street and Hemlock. The question isn’t whether or not Cannon Beach needs a new City Hall, but where it’s going to go. City Manager Bruce St. Denis had a more streamlined list and suggested using three categories in the decision-making process; cost, tsunami resiliency, and proximity to the city center. At around $100,000, the current City Hall is appraised at about the same price the city spent on the most recent bathroom and kitchen upgrade — and a far cry from the estimated $15 to $30 million needed to rebuild. Reports say it isn’t seismically sound and wouldn’t survive larger tsunami events. The RV site was first discussed in 1996 and purchased by the city to serve as a potential alternative site for the City Hall or an elementary school. While the clay soils at the RV park will not likely result in liquefaction that could result from a Cascadia Subduction Zone event, the impact of prolonged shaking after a quake drew council concern. The campground has also recently invested in upgrades and could potentially be impacted by the project. The RV park might lose up to 30 sites with a new City Hall, a significant impact for a small business. Two neighbors expressed concern at the work session for the potential congestion a new municipal building would bring. City Councilor Nancy McCarthy suggested the possibility of using the Tolovana Hall site at 3773 South Hemlock. While Tolovana Hall wasn’t immediately ruled out, the size of the lot is less than a half acre and smaller than the existing City Hall. It couldn’t even come close to accommodating the required parking. Another site along Spruce Street was specifically set aside as a reserve and Mayor Sam Steidel was hesitant to even consider using that site for the City Hall, calling it a nonstarter. The Spruce Street location has a 10-acre upland area in the large tsunami inundation zone, yet free from landslides. 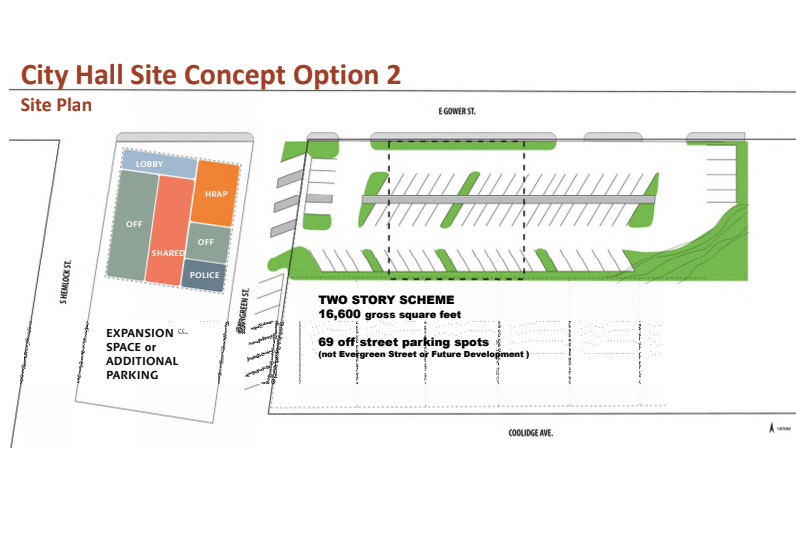 It is centrally located but would need to be rezoned and parking facilities added. Councilor Brandon Ogilvie said he anticipated a “lot of pushback” to building in the reserve. One thing the council could agree on was the need to get going on the topic of where to put city hall. “I’m not tired of it yet, but I’m getting there,” Steidel said. “It’d be better to identify a site and then move forward with a study, not just look at site after site,” said Councilor Mike Benefield. The council agreed to consider the list of alternatives provided by St. Denis and Steidel and be prepared to discuss the issue at an upcoming work session.